This is a nice variation on the traditional mac 'n' cheese that incorporates chicken and smoky flavors. 2. Heat 1 tbsp. olive oil and 1/2 tbsp. butter in a 10-inch frying pan over medium heat. Sauté chicken until cooked through, about 8-10 minutes. 3. Heat 1 tbsp. olive oil and 1 tbsp. butter in a large, oven-safe 12-inch nonstick frying pan over medium heat. Add onion and garlic and sauté until soft and fragrant. Season with seasoned salt and fresh-ground black pepper as desired. 4. Sprinkle with flour and whisk mixture while cooking, about 2 minutes. Add milk and continue whisking until mixture begins to bubble and thicken. Reduce heat to low. Add shredded cheese by the handful and stir to incorporate while it melts. Continue until all the cheese has melted and the sauce has a smooth texture. 5. Preheat broiler on high setting with oven rack about 6 inches from broiler. Pour sauce over cooked pasta and combine with cooked chicken. Return pasta mixture to frying pan. 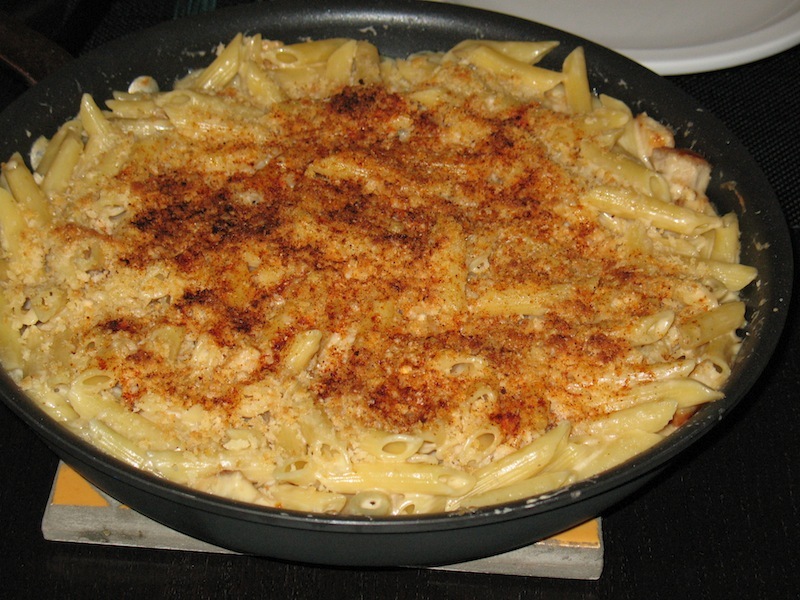 Mix together bread crumbs, parmesan cheese and smoked paprika and spread evenly over the top of the pasta. Spray topping with olive oil. Put pan in oven and broil until the crumb-cheese top is lightly browned--watch carefully to avoid burning.